HOMELESS LIGHT UP LONDON THIS CHRISTMAS Spare a thought for London’s homeless this winter, as many are out in force this season to bring some much needed festive cheer to the capital’s weary Christmas shoppers. 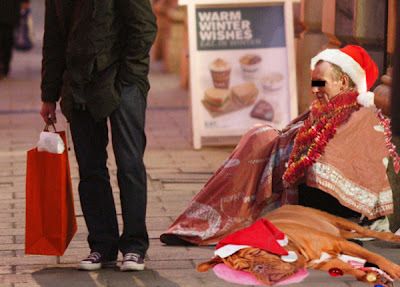 The growing dishevelled community are out in their hordes on London's streets, making the West End and other main shopping and tourist areas light up - with a little bit of holiday happiness by wearing cheery santa hats, tinsel and flashing fairy lights. The homeless lights were officially turned on by the cast of Made In Chelsea last Friday, and have proved to be an instant success. “Some wear tinsel on themselves or their cute dogs, and others actually wear twinkly blinky fairy lights - its wonderful and it really lights up the darkened streets in winter – and what's more its a free treat for the shopper!” remarked a delighted Bond Street visitor Amanda Burlington- Arcade. Prime Minister David Cameron shook up the debate over executive pay yesterday when he demanded "clear transparency," and "no gimmicks" or "tokenism" when it came to reforming the financial system. 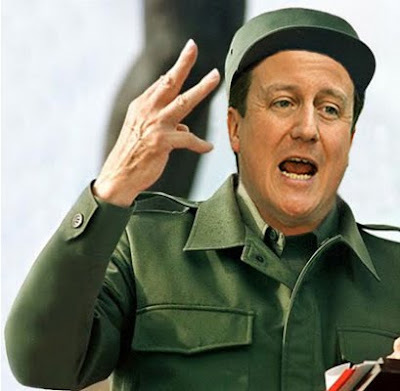 Wearing military fatigues and occasionally puffing on a large Cuban cigar, Mr Cameron ranted, banged his fist and occasionally foamed at the mouth whilst blaming the great Satan, the United States of America, for the current economic woes afflicting the world.